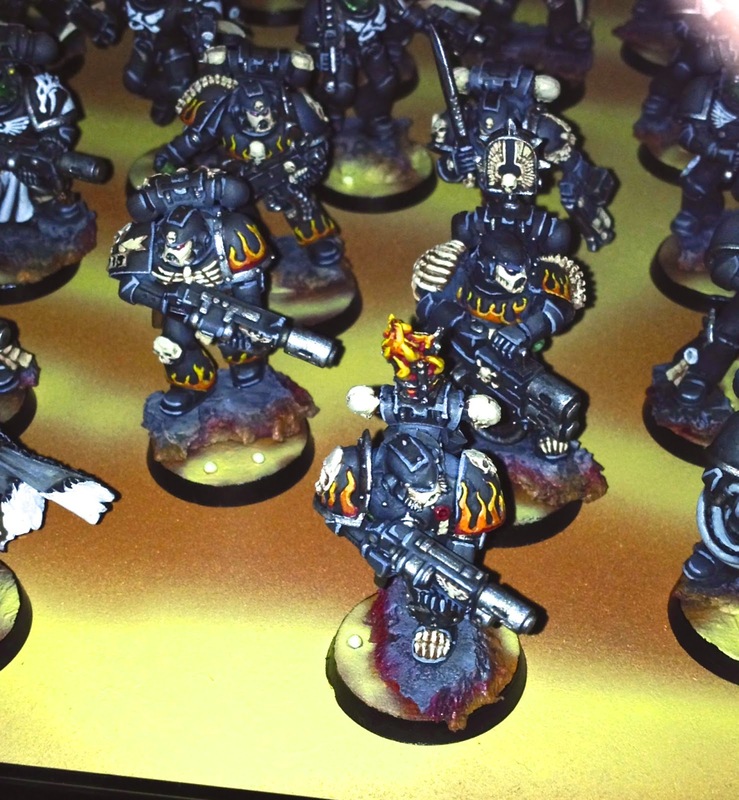 The Preferred Enemy: Painting Black Dragons Like Mad! Another long break but I've been mad, MAD I say trying to paint these Black Dragons for the BAO this weekend. After several games of 7th edition I really like how this army plays and decided to go all in and commit to getting this army Tournament ready. But that means painting 1-2 hours every day which is not easy to do with my crazy life. The good news is I'm almost there now. On a whole if I show up with where I'm at now this weekend I'm pretty pleased. I want to get skulls on the shoulders and more of the insides done of the other 7 pods but we'll see how much I actually get done. A little closer, terrible camera phone pics. A bit closer on my Vulcan model. I'm still terrible at freehand and the banner is not complex, but the 'Faith or Death' turned out better than I hoped so I have to be a little pleased there. A terrible picture again but I've added a unit of LotD to the army for 1850. Back when I redesigned the army in 6th I had thought to just add a librarian for some utility. In 7th I'm just not sold on the solo libby. It was suggested I add a Thunderfire to the list and that certainly has merit in a pod list. If I didn't already have 9 pods that might be great, but as the list is designed the 3 assault squads do pretty good anti infantry work (plus lots of bolters). The LotD came up and I have used them a few games now. They really help get rid of that one skimmer or MC in cover that you need to take out that you don't want to waste a bunch of single shots from the tac squads. They've been killing venomthropes and taking down Wave Serpents. I had to give up my army wide Melta Bombs but they've been probably more useful across all games. The army now looks like this at 1850. The combi Plasmas are master crafted and I MC the CC weapon on the assault sergeant. The Locator Beacon is essentially the last 10 points but usually the pod is ignored and it gives me some choice drops turn 2. I've had some great close games with the pods and done really well. A few games I've nearly been tabled but still pull the win thanks to a silly pod being on an objective. So we'll see how BAO goes. I'm trying to keep my expectations low and hope to go 3-3 but it is of course easy to get hungry for wins. I'll be going in for a good time first and foremost and hope to have 6 really fun games! Wow, painting NINE drop pods on a schedule! Remember to savor every clutch podded unit you deploy at BAO, because you earned it.